So simple and happy. Colorblocking = cheery + uses up scraps. Bet those pockets are fake. Must remember to topstitch more of his clothes to make them look more professional. That little tie’s probably sewn on, too. Not spending $8/pair on everyday baby shorts, not when I have patterns and stashes. Save a step when upcycling shirts into a new shirt! Line up the hems if you can before cutting. 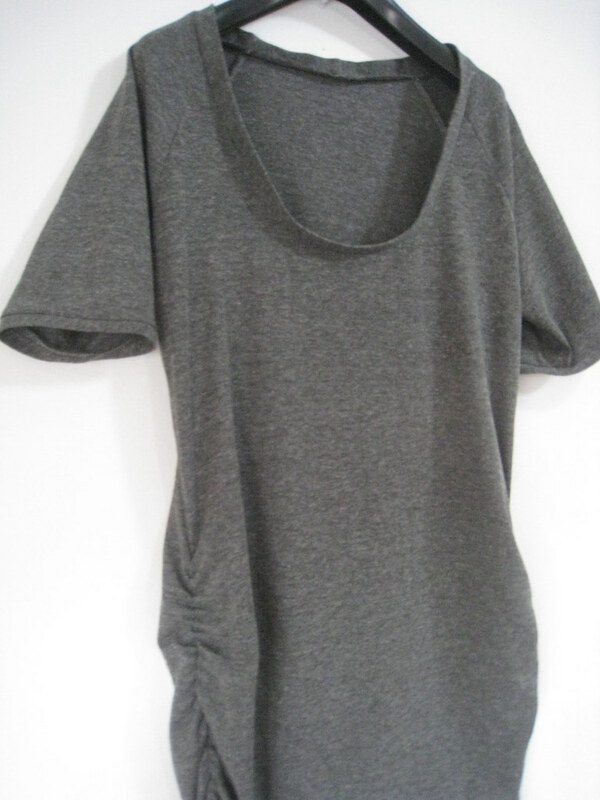 Like on this raglan t-shirt with a straight hem. 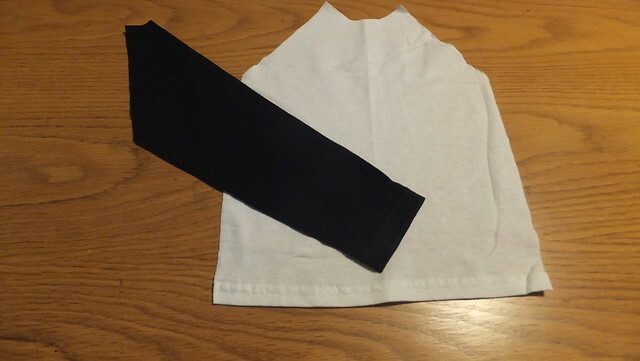 Its sleeves also have straight edges at the cuffs. I lined the body up against the hem of a white t-shirt, and the sleeves on a black one. One less step now at the end. It’s all hemmed! 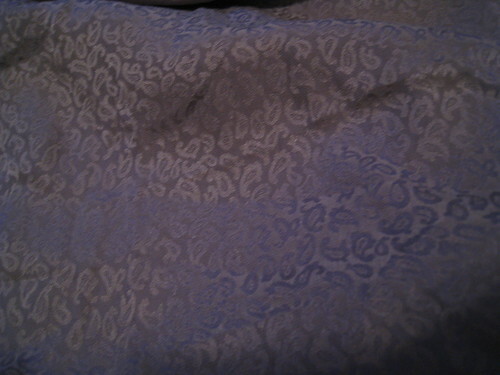 Gray paisley silk, pristine condition. Must cut down to something sharp. It’s really a giant dress, with covered buttons. Purple heather knit. Already an awful ugly T-shirt. I keep picking up patterns in these shapes is the good news. I cut a cute knit top out of a boxy cashmere sweater using a pattern for the bodice, and pinning the sleeves. To cut the pattern (here from McCall’s 6164) I marked the center of the sweater front with chalk, and traced each side, instead of folding the sweater and doing both at the same time. Got more precision that way. Did the same for the back. Marked the line with chalk. The sleeves were trickier. 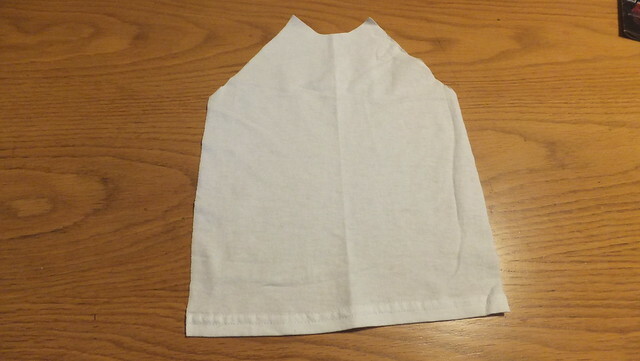 The important part was the armhole part. I used the 6164 sleeve pattern piece to trim the top of the existing sweater sleeves into the right shape, first one side, and then the other. Pinned the sleeves into place. Stitched. They were still baggy – the wrong shape for such a fitted bodice, so I pinned them tighter and stiched along the pins. Finished the seams, then trimmed the excess carefully. This proved important because it gave me fabric to use for the neck’s binding. I admit, this wasn’t a perfect science. The binding strips kept rolling up so it was hard to keep them even. 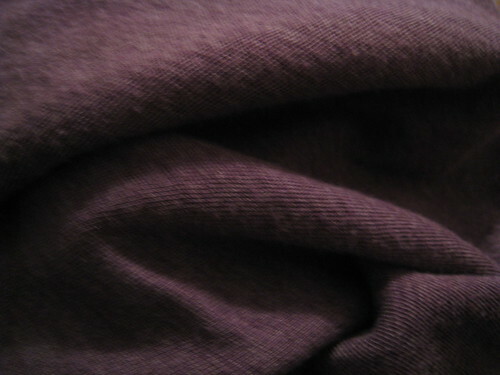 And the back of the sweater started with a raglan detail in the knit, which carried over to the final cut. You know, for when you don’t want to be that naked. Which for me is almost always. I turned this bodice into cap sleeves with a few little lines. I’ve done this a few times now (once for this dress), and it’s really not hard. So you trace the front and back bodice pieces as you would, skipping the armhole curve. You mark the underarm, you know, where you’d cut it for sleeveless. Can you see the purple marker dots at the top and under the arm? Then you basically draw a line out from the shoulder, extending it straight. And you draw another line up from the outermost point of the underarm, where you’d start the side seam. 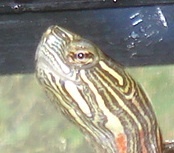 (This picture shows the other side.) Sew the shoulder seam as directed in the pattern instructions. 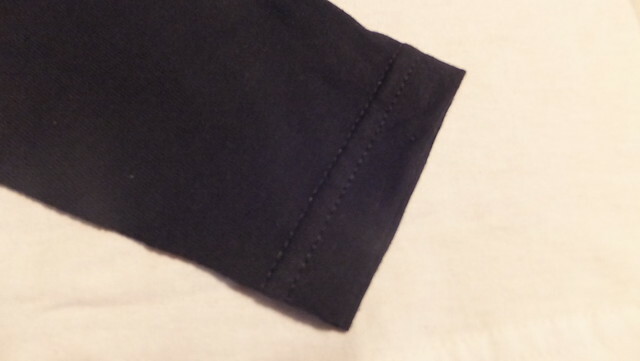 Sew the side seam also as directed, leaving the sleeve hole open. 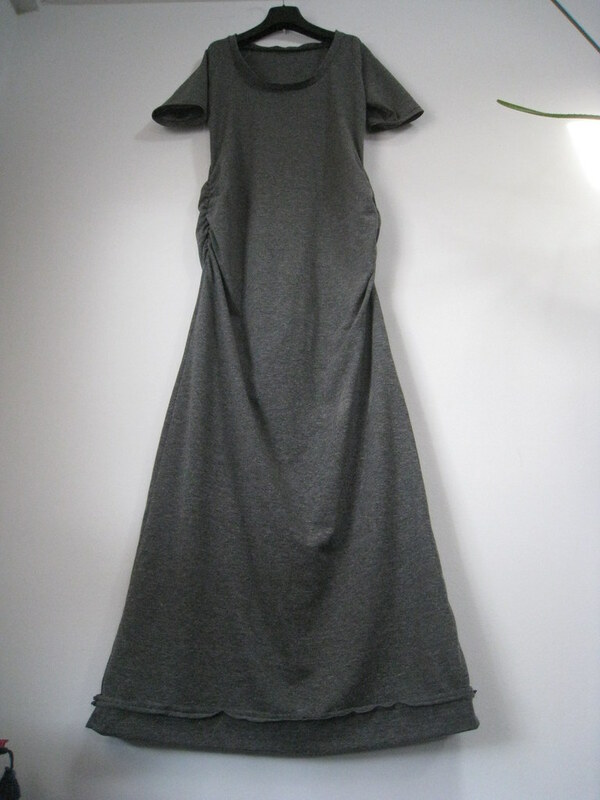 Hem that however you like to hem sleeves. Since this is knit, I basted 5/8″ along the raw edge, folded over on the basting, and stitched. Left the seam allowance as is. Knits won’t unravel. Voila— cap sleeves.